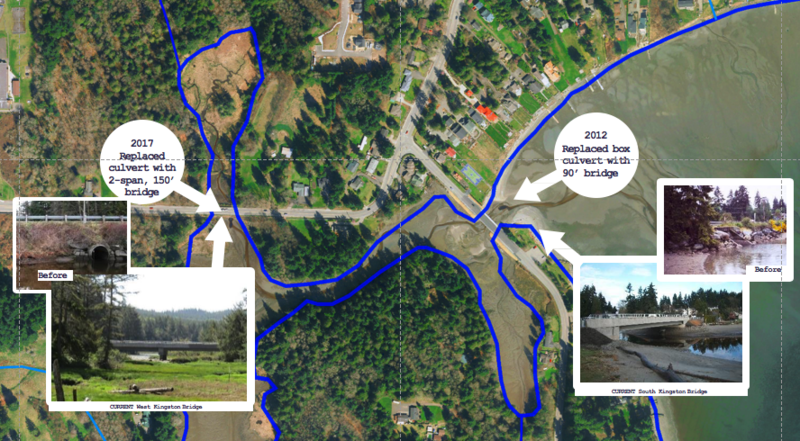 Since 2005, Stillwaters Environmental Center near Kingston, WA has been documenting ecological conditions in the 30+ acre Carpenter Creek estuary and salt marsh. With the recent replacement of a second undersized culvert with a bridge, natural tidal flow has been reestablished in the marsh. Our monitoring and research program addresses the complexities of a marsh ecosystem and its recovery. Our data collected prior to the bridge construction provides a rare opportunity to compare pre- and post-restoration data on several parameters, for a better understanding of how culverts affect these ecosystems. There have been relatively few studies of West Coast salt marshes in general and Puget Sound salt marshes in particular. Maintaining our citizen scientist data collection through the recovery process will continue to provide an important resource for students and other researchers interested in these ecosystems and for other environmental groups interested in the recovery of their own Puget Sound systems. Prior to culvert removal, fresh water inputs predominated in the marsh in most seasons, encouraging the growth of brackish water plant species and several invasives. With culvert removal, we expect salinity to increase, hopefully reducing invasive plant species and favoring the establishment and expansion of native halophytic plants. Using vegetation surveys as well as water level and quality sampling, we will examine in greater detail the relationships between marsh hydrology, water quality, and vegetation changes over the course of salt marsh recovery. We hypothesize there will be areas with increased salinity, reducing invasive plant species and favoring the establishment of native plants. However, invasives that tolerate salt better as adults may persevere where there is sufficient fresh water input in the spring to allow them to initiate growth, despite halophytic conditions in summer. Meanwhile, areas of higher fresh water inundation due to runoff from adjacent housing development will retain their invasives and brackish or fresh water. Increased tidal flow into the marsh should increase dissolved oxygen and nutrients in surface water, which may also affect plant composition of inundated areas of the marsh.